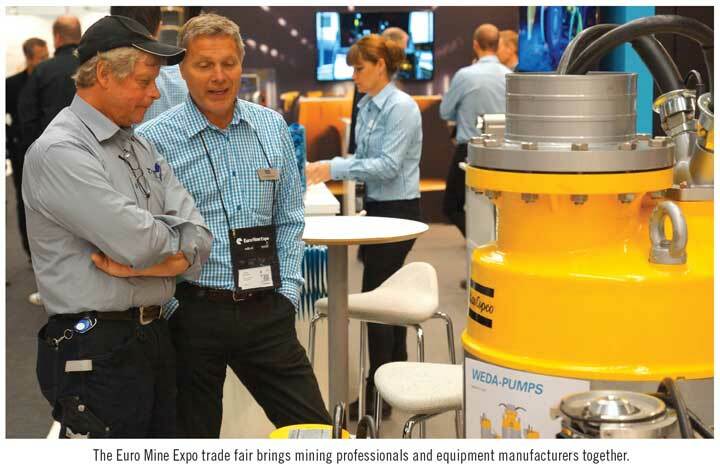 The Euro Mine Expo International Trade Fair & Conference, which takes places every two years, will be held June 14-16 in Skellefteå, Sweden. Located centrally to several mines, mills and smelters in the region, Skellefteå has a rich mining history and offers a great setting for miners and vendors to build business-to-business relationships. While the business climate has changed in the last two years, Euro Mine Expo’s organizers said that companies are quite eager to participate. In 2014, more than 2,000 people from 36 countries attended. Euro Mine Expo 2016 has four gold sponsors: Atlas Copco, Boliden, Outotec and Mandalay Resources, and an exhibition with a little less than 150 companies. “We have a few open stands in the copper hall and the outdoor area,” said Jaana Tengman, project manager for Nolia. “Unlike the others that may have wanted to test the waters in the past, these companies are committed to the mining business in northern Sweden. They realize that this is a soft period and, when the business turns, they want to have a foot in the door.” Nolia is the biggest organizer of fairs in northern Sweden. The company also undertakes national and international consulting assignments, bringing together more than 200,000 people every year to exchange experience and to network. Euro Mine Expo also offers a technical program with presentations geared toward professionals in mining and mineral processing. 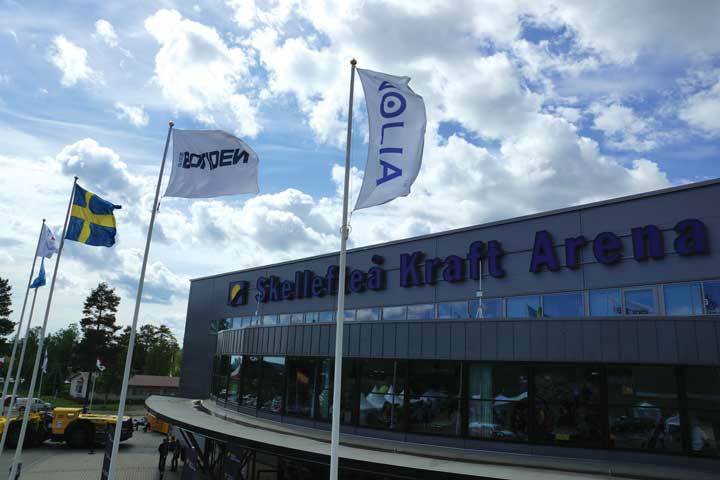 With the help of Luleå University of Technology (LTU), which is situated just to the north, along with its gold sponsors and other organizers, Nolia has developed a program with information for everyone. The formal program consists of three sessions: Innovations & Business Development, Sustainability in Action, and a Market Outlook. It begins on Tuesday afternoon with sessions on Wednesday morning and Thursday morning. Other sessions and meetings have been organized peripherally and the details of those will be posted at www.eurominexpo.com. In Skellefteå, hockey is one thing that is more important than mining. Euro Mine Expo takes place at the Kraft Arena. Named after Skellefteå Kraft, a Swedish power company, the 6,000-seat venue is home to the Swedish Hockey League’s Skellefteå AIK, as well as Division 1’s SK Lejon. Readers should note the scoreboard above the show floor in the photo on the opposite page. A compelling technical program adds significant credibility to a trade fair. During trying times especially, it is difficult for mining companies to justify attending a conference unless it has an educational component. 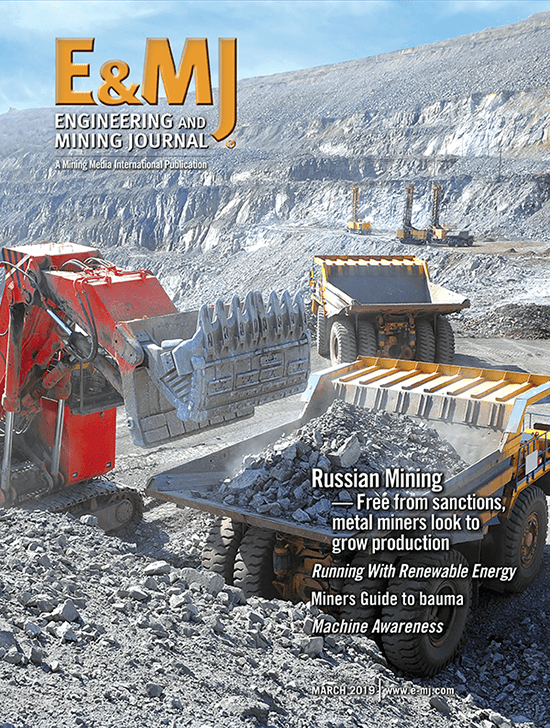 “Holding a successful Euro Mine Expo is very important for this region and LTU—the mining university for this region, which is recognized worldwide,” said Sven-Erik Österlund, vice president, LTU Business AB, who has served on the Euro Mine Expo organizing committee since its inception in 2008. Established in 1983, LTU Business AB is a business development branch of the university that focuses on the commercialization of research and continuing education in the region. The opening session, Innovation & Business Development, offers a technical perspective. The first speaker, May Hermanus with the Council for Scientific and Industrial Research (CSIR) South Africa, will explore future technology needs. “During these periods of low metal prices is when the mining business usually sees some of its greatest innovations,” Österlund said. He cited the Boliden presentation on 5G as an example. During that presentation, Peter Burman, program manager mine automation, Boliden, will discuss the fifth generation of wireless technology. The second session will delve into several aspects of sustainability. Referring to Karl-Erik Rånman’s presentation, The Fossil Free Mine, Österlund explained there is a big push in this region to distance themselves from carbon emissions. “For the mines of course, this means replacing diesel-powered equipment with biofuel or electrically powered equipment and using electricity generated from an emissions-free power plant,” he said. Following Rånman’s presentation, two LTU researchers will discuss a path toward sustainability. On the final day, presenters will turn their attention toward the markets and offer delegates thoughts as to where it is heading. nologies and services delegates can expect to see. fordable solutions to increase capacity. 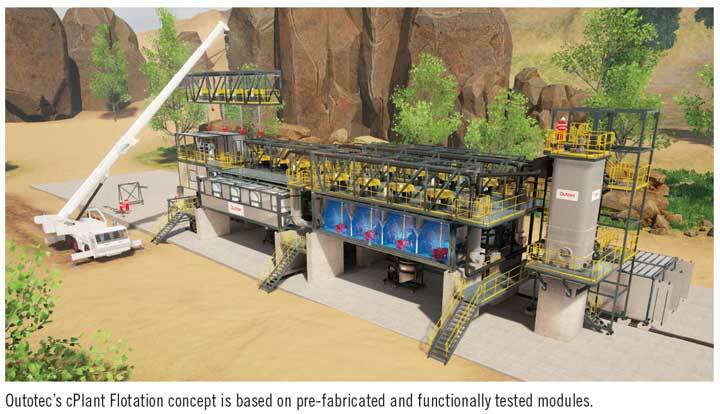 The highlights will be the new cPlant Flotation concept and sensor-based ore sorting. cept. The plant is based on pre-fabricated and functionally tested modules inside container-sized steel frames that can be easily transported and installed, and quickly connected to the process. In the core of the plant is Outotec’s proven flotation technology with FloatForce mixing mechanism and other Outotec TankCell features. As most of the installation and test work is done at Outotec’s workshop, the plant requires less labor and lower capital investment than a conventional flotation plant. The plant’s modular construction makes it economical to move to a new site once the ore deposit at the old site is processed. Outotec’s sorting solution is a sensor-based ore sorting method that provides significant economic benefits by removing waste from the ore feed in the crushing and grinding circuit of a concentrator plant. 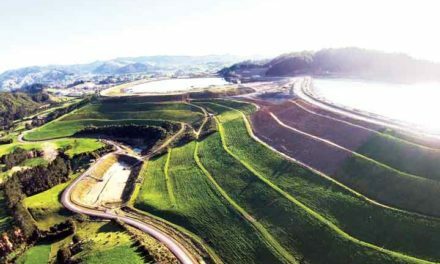 In a greenfield application, sorting reduces capital investment and operating cost because waste rock is not consuming capacity from the process. In brownfield applications, sorting benefits existing concentrator plant in two ways: by removing waste rock that consumes capacity and increasing head grade of the concentrator feed. Fast and accurate grade control is the key to an effective mineral extraction process and ultimately to mining productivity and profitability. That’s why Atlas Copco Secoroc extended the RC hammer range with COP RC45—the smallest, lightest and fastest reverse circulation hammer ever. The 120-mm (4.5 in.) COP RC45 reverse circulation hammer features a revolutionary new design. Since it is 40% shorter than the nearest competitor and more than 30% lighter than most hammers doing the same job, one man can easily handle the hammer by himself. 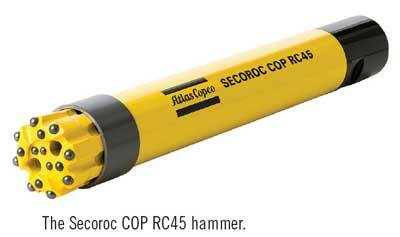 Like the RC 50, the COP RC45 hammer features Atlas Copco Secoroc’s tube retention system. This design allows fast and easy service, and tubes are quickly replaced without disassembling the hammer. The result is less time servicing the hammer and more time sampling. Designed to be efficient and robust, Finnish work light producer Nordic Lights believes its LED combination headlight will set a new standard and offer a brighter future for heavy duty equipment. 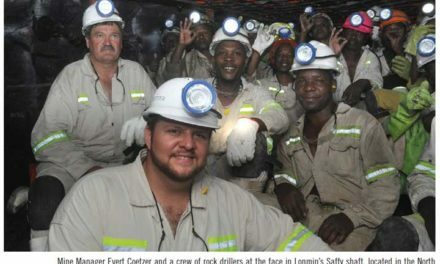 Since the work day does not necessarily start at dawn and end at dusk, miners need powerful illumination, not only for work to be efficient but also to maintain safety in darkness. The Sculptor LED N60XX is the world’s first all LED, ECE-approved combination headlight in serial production. Developed for the most demanding working environments around the world, the lamp offers headlight, park light and 180° indicator in one application. The dimensions of 233 x 161- x 134-mm is extremely compact for a combination light. The universal design of the combination light also makes it an interesting and suitable option for equipment with shorter production series. Nordic Lights’ Quake dampening system takes the durability of headlamps to a whole new level. 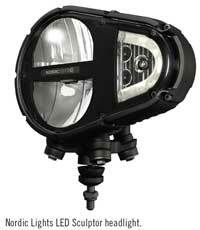 The combination headlight withstands shocks of 60 G and vibration of 15.3 Grms at 24-2,000 Hz. The LED diodes have much higher vibration resistance compared to halogen bulbs. Cooling is effectively handled by thermal transfer through the alloy housing to the cooling lamellas at the back. Devico will exhibit its latest surveying product line. The company invites miners to visit the stand and learn why “smarter exploration’” can be summed up by three letters: DCD. When seeking to maximize exploration budgets, Directional Core Drilling (DCD) is often the solution. Devico offers DCD services worldwide. Many drilling contractors and mining companies have used the technique to increase precision, reach multiple remote targets with continuous coring, save time and cost, make wiser decisions, and successfully improve profitability. Manex AB (Stand 175), Belzona’s distributor in Sweden, will showcase innovative solutions to erosion and abrasion in liquid and solids handling equipment. Belzona 1800 Series resins, containing coarse and fine particles, effectively resist abrasive media at low impingement angles. The company’s line of elastomers, in turn, are recommended at 60º–90º impingement angles, because much of the impact energy can be dissipated through elastic deformation. Finally, for erosion-corrosion repair and prevention, Belzona 1300 Series materials with ceramic fillers perform exceptionally well in immersed conditions. Visitors will also be able to use an interactive display table to navigate through a mine and see typical problems that Belzona can remedy. Santasalo will showcase its AMF vertical-mounted gear units. 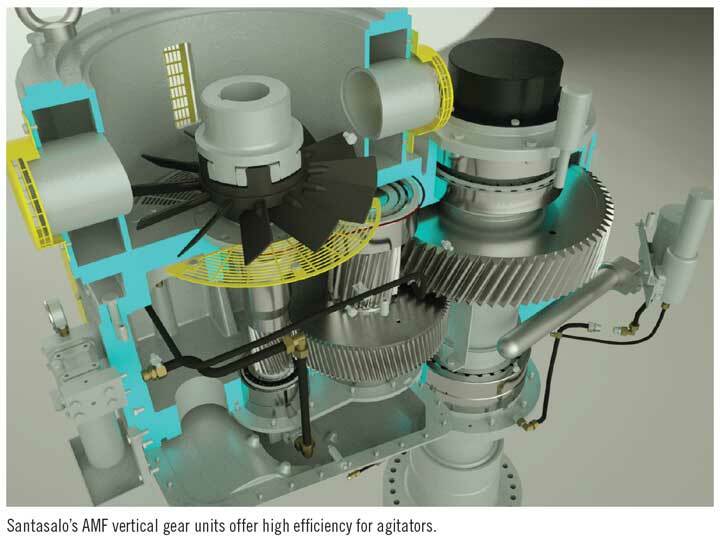 By incorporating a bidirectional axial fan, optimized housing design and additional new features, the AMF vertical gear unit eliminates the need for external cooling in extreme ambient conditions. These units feature Santasalo’s proven drive technology, in operation in thousands of vertical mixing applications around the world. Direct-drive construction with electrical motor and flexible HSS coupling ensures high efficiency, while the highly optimized gear unit layout results in cost savings and a smaller footprint. as well as a reversible operational direction. A robust design ensures they are easy to transport and install without risk of damage. Santasalo already delivered the first order for the AMF gear unit series in Kazakhstan (five units) and two additional projects are currently being delivered for fine grinding applications in U.S. (six units), and Australia (three units). Replacing the previous Real Aperture Radar (RAR) technology with Synthetic Aperture Radar (SAR), IDS allowed mine slope monitoring systems to move from monitoring focused areas to entire pit walls at a high resolution. In 2012, IDS took another step forward, adding a new dimension with the FPM360 system, which enables a mine to integrate data from multiple IBIS radars through a single user interface to provide full coverage of an entire pit. Currently, the IBIS radar family offers the right solution for every mine slope monitoring need: the IBIS-FM long-range solution up to 4.5 km; the IBIS-FMT mobile long-range version, which is easily towable by a light vehicle; and the IBIS-Rover mobile medium-range radar for broad area slope monitoring. The only Synthetic Aperture Radar with a rotating antenna capability, the IBIS-Rover provides a 270° field of view with a scan time of just 4 minutes. At Euro Mine Expo 2016, IDS will present revolutionary developments in radar monitoring: the IBIS-FB and IBIS Guardian TrueVector. IBIS-FB is a remote sensing monitoring system designed to support the assessment of blasting operations and control their impact both on the pit slopes and nearby structures. IBIS-FB integrates standard vibration monitoring systems providing remote broad area measurements of ground vibrations with high accuracy. After every single blast, IBIS-FB measures a range of performance indexes at multiple points at long distances, even allowing data to be received from within inaccessible areas that traditional monitoring systems can’t monitor. IBIS Guardian TrueVector is a feature-rich software suite for the interpretation of IBIS radar data and the management of slope stability risks in open-pit mining operations. With the TrueVector technology, IBIS Guardian is able to resolve the spatial direction of displacement vectors for hundreds of thousands of overlapping radar pixels that have been monitored simultaneously by two or more radar systems. Accuracy is sub-millimetric. No prisms, markers or reflectors are required on the slope, instead, the IBIS systems rely on natural backscattered information to rapidly resolve spatially dense and continuous x, y, z, displacement information. Alimak Hek is a global market leader and pioneer in designing, developing, manufacturing and servicing industrial rack-and-pinion vertical access solutions. More than raise climbers, they are well-known worldwide for providing high-quality hoists, elevators and platforms. Alimak Hek recently completed a shaft refurbishment project for the Tauern Tunnel in the Austrian Alps. The Tauern Autobahn near Salzburg serves as an important north-south connection in region. The 6,500-m tunnel tubes are equipped with full cross ventilation and each tube is divided into four ventilation zones. Air handling units are located at the north- and south portal, as well as in a cavern between both tubes in the middle of the tunnel. The cavern is connected to the surface by a 600-m high, 10-m diameter shaft. 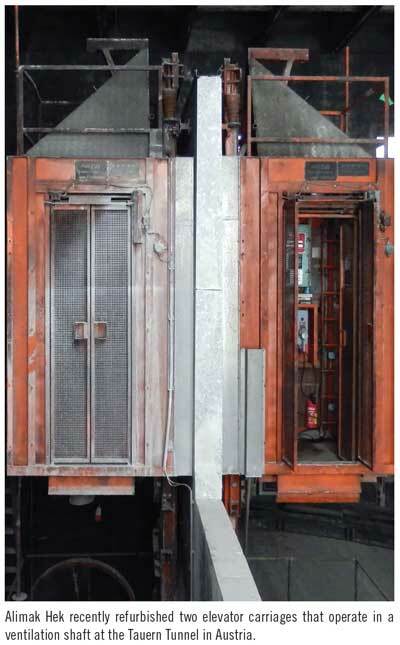 Alimak rack-and-pinion elevators for personnel transport are mounted on the shaft’s center wall, which splits the intake and exhaust air. 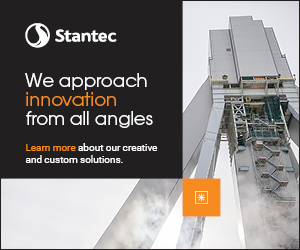 The elevators operate by using a hoisting system that consists of winches, crane girders and deflection rollers. as the transformers, were refurbished. The project was timed to minimize traffic interruption as much as possible. During the early autumn months, the elevator cages, electrical cabinets and winches were dismantled. Using chain hoists, muscle power, precision and a special loading crane, these parts were brought through the top of the shaft. Specially constructed equipment was also used at the bottom of the shaft to disassemble the horizontal carriage, winch and electrical cabinets: A HEK MSM Super mast climbing work platform transported the equipment from the recess to the shaft base. Refurbishment was completed in an ISO-certified Alimak Hek production facility in Skellefteå. After structural and electrical engineering tests, all components still usable were cleaned, sandblasted, resealed and freshly painted. In addition to the Alimak components, the access stairs and railing in the recess of the supply air lift were cleaned, and the protective housing of the horizontal carriage was refurbished. Completely refurbished and fitted with new safety devices, gears and motors, the components began their journey back to their place of origin. Thanks to the experience gained during the disassembly and with the help of the equipment retained, the special elevator installation was able to resume its service after successful installation. What’s the role of KIC and other EU Initiatives? Georgette Barnes, Ghananian entrepreneur and owner of drilling company, chairwoman of Ghana Georgette Barnes Ltd.
Sarah Downes, MSc, Environmental Quality Management, Repic. Market Outlook: A Light at the End of the Tunnel? Magnus Eriksson, professor, Mineral Economics, LTU and co-founder and partner of the Raw Materials Group (RMG).